The first male tiger was rehabilitated in Rajasthan’s Mukundra Hills National Park (MHNP) after years of attempts by the experts who have been following the Wildlife (Protection) Act, 1972. After Ranthambhore National Park and Sariska Tiger Reserve having a sufficient tiger density, the MHNP now received the male tiger Mirza, RT-91, which was released in a 28-hectare enclosure in Darrah range of the park by the state wildlife and forest department catchers on Tuesday afternoon. Mirza was honey-trapped and tranquillised in Ramgarh sanctuary (Bundi district), close to RNP in Sawaimadhopur by the wildlife department. It was taken safely to MHNP by road. Criticising the relocation as “totally wrong”, the convenor of T-24 Social and Wildlife Forum Rupesh Kant Vyas told The Tribune, “It was carried out without the permission of the National Tiger Conservation Authority (NTCA) and rules of rehabilitation were flaunted by state authorities. NTCA has been asking the state government to furnish a plan of relocation of the tiger, if required in MHNP, but it failed to do so. “We will study the case and move the court against the relocation,” Vyas said. 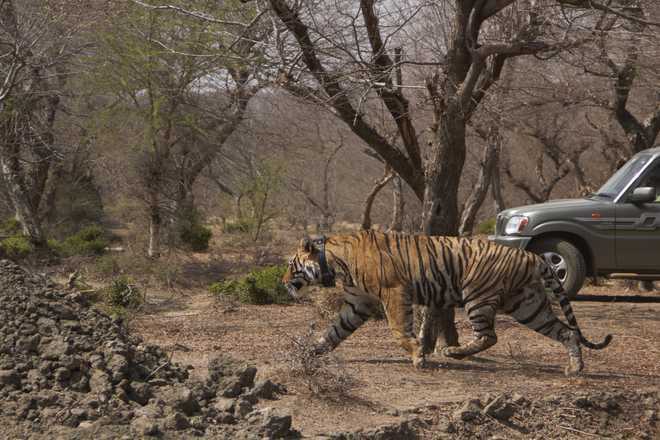 After the successful relocation of Mirza, in a press statement Chief Minister Vasundhara Raje, whose Jhalawar constituency is nearby, congratulated the people of Hadoti region to have a big cat and commended the joint team efforts of wildlife department and forest officials.